A sledgehammer is often used to break thick items, such as concrete, but it can also be used as a strength-training tool. Fitness classes are incorporating sledgehammers and tractor tires into a workout designed to improve strength and power while increasing muscle mass. Swinging a sledgehammer against a tire can also help alleviate stress and built-up aggression. Sledgehammer chops resemble the action required to split wood. When you perform a chop, you move the sledgehammer in a diagonal manner across your body from either your right shoulder toward your left leg or your left shoulder toward your right leg. Fitness classes have you hitting a large tire at the bottom using this motion. This exercise strengthens your core, glutes, hips, forearms and wrists. Because sledgehammers are heavy, your forearms stay contracted during sledgehammer workouts. If this did not happen, you would not be able to hold onto the sledgehammer. This isometric contraction improves the strength and size of your forearms. A heavier-weighted sledgehammer will fatigue your forearms quicker while also increasing their size. You choose the angle at which you swing the sledgehammer. This angle can be over your shoulder so your bottom arm bends to lower the sledgehammer behind your body. When your bottom arm straightens to lift the hammer, your tricep contracts. Sledgehammer workouts require a high number of repetitions, and constantly extending and contracting your triceps increases the strength and size of your upper arms. 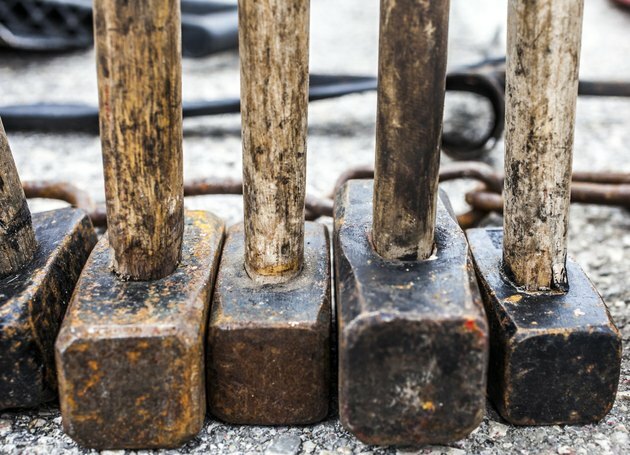 It is important to perform an equal number of hammer movements on each side for even muscular development. When doing sledgehammer workouts, switch sides every 10 to 15 strikes so you use your arms evenly. Swing the hammer to the right and left sides of your body. The size of your forearms will increase overtime. As your arm size and strength improves, you will notice an improvement in your reaction time and will be able to complete more repetitions than you previously could.